Humani Handbags launch a collection just for the Mrs. America 2013 contestants. Title holders from over 16 states have purchased the collectors edition bag, thank you Alabama, Alaska, Arizona, Florida, Illinois, Indiana, Massachusetts, Mississippi, Tennessee, Utah, Vermont, California, Washington,...and more. We will keep all of you posted as to what project this profit share (Humani mission) has helped fund! At the beautiful Loews Ventana Canyon in Tucson, see you all at the finals on Aug. 28th, beautiful gowns and bags! 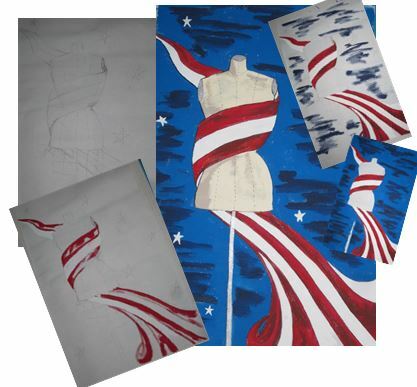 The fine art painting design that was hand painted each time for all specialty bags just for the Mrs. America contestants. 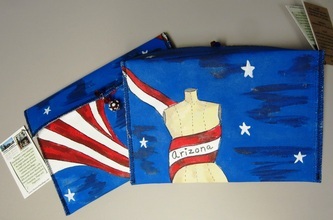 Each bag is hand painted around the theme create by the designer for the specialty bags for that year! We are excited to bring you the 2013 Exclusive Mrs. America Collection. 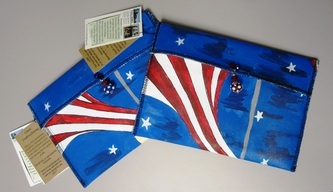 Lined with bamboo inner-lining and covered with vintage American made fabrics to continue the Mrs. America theme. We were honored to make these, what a fun order to create!